Last week the All-Party Parliamentary Group Friends of Syria held a discussion around the film Last Men in Aleppo, screened the same evening on BBC 4. Amongst those taking part was Alistair Burt, Minister of State for the Middle East. We went along to hear what he had to say, and to ask some questions. Much of the minister’s remarks concerned opposition to military intervention in Syria amongst the UK public. Mr Burt argued that the vote in 2013 was not just a block on any possible military action, but a missed opportunity to persuade the regime to agree a more peaceful negotiated solution. The minister portrayed the UK now as having little say any more in events. Missing in this was the fact that the UK has militarily intervened in Syria. The UK Parliament voted to intervene against ISIS in 2015, and the UK now shares responsibility for the consequences of that one-eyed campaign; consequences which include not just the near-total destruction of the city of Raqqa with civilian casualties comparable to the fall of Aleppo and with further mass displacement of ordinary Syrians, but also the retaking of territory by the Assad regime and its allies, Russia, Iran, and Hezbollah, striking as much fear in the heart of many Syrians as did ISIS. You can read the minister’s remarks on the APPG Friends of Syria website. 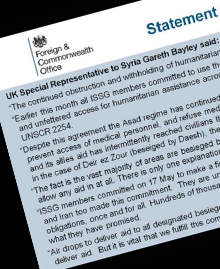 Syria Solidarity UK believes the UK still has the capacity to act to protect Syria’s civilians, and has a duty to defend international humanitarian law, which has in so many cases been shredded in Syria, including it would seem by our own allies. 2. Tracking and publishing of radar information on the aeroplanes bombing civilians. We need the UK to publish tracking data to hold Putin and Assad to account today, not just in the future. We need to hold them publicly accountable not just for chemical attacks, but for all attacks that target civilians. As long as we have no judicial body to hold them to account, we need the UK and others to present as much evidence to the public as possible, so that all the peoples of the world can demand their governments do their part. On aid airdrops, feeding all 400,000 people under siege in Eastern Ghouta by air drops might not seem possible, but the UN did feed some 70,000 people in Deir Ezzor solely by airdrops from February 2016 to September 2017. The UN made over 300 airdrops to Deir Ezzor, including with precision guided JPADS parachutes. The UN of course refused in 2016 to drop aid to areas besieged by the regime without explicit regime permission, despite all the countries of the ISSG calling on them to do so. The ISSG—the International Syria Support Group—included not just countries like the UK, US, and France; it also included Russia and Iran. 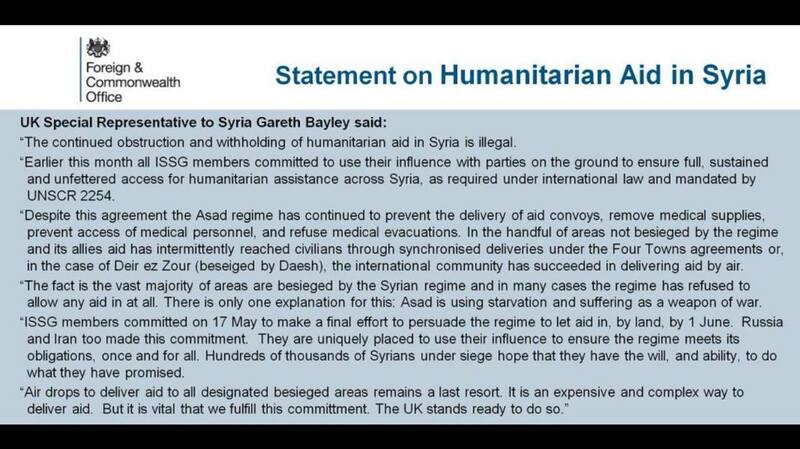 This promise on aid airdrops has not been kept by the UK Government. Of course some feared that manned airdrops might be attacked. Would the Assad regime really have risked the consequences of such an act? After Russia and the regime were allowed to go unpunished for their murderous attack on a UN aid convoy in September 2016, one might well fear that they would. There are three ways to avoid the risk of attacks on airdrops: One is to make a credible threat of decisive retaliation; another is to drop from high altitude as the UN did for Deir Ezzor; and a third is to use unmanned aerial vehicles—UAVs or drones. UK and US officials discussed using drones and guided parachutes for aid in the last weeks of the siege of Aleppo, but then as ever they folded in the face of Assad and Putin’s violent aggression. As recently as January and February, the UK Government was saying that it was still considering using drones for aid airdrops, and yet it stood by as civilians from one town after another were forcibly displaced by Assad, Hezbollah, and Russia. From Wadi Barada. From Madaya. From Al Waer. Tens of thousands more Syrians were forced from their homes by starvation sieges while the UK did nothing. Alistair Burt laments the failure to act in 2013. If we continue to stand by while Eastern Ghouta is starved and bombed—if we won’t even drop aid to the starving—how will we look back at this failure to protect civilians in 2017?